Today, the challenge for leaders at every organizational level is no longer just to outmaneuver and outhustle the competition; it is to outthink them in ways both large and small, developing a distinctive point of view about the future and helping your organization achieve the competitive advantage. Strategic planning involves stepping back from your day-to-day operations and asking where your business is headed and what its priorities should be. The Balanced Scorecard (BSC) is a strategy performance management tool used to keep track of staff accomplishments and activities and focus efforts in a laser-sharp manner. The BSC was developed in the early 1990s by Doctors Robert S. Kaplan and David P. Norton. While they named this system the “Balanced Scorecard,” by 2000, it had gained momentum as part of a more comprehensive strategic management system. “The Balanced Scorecard retains traditional financial measures. But financial measures tell the story of past events, an adequate story for industrial-age companies for which investments in long-term capabilities and customer relationships were not critical for success. Kaplan and Norton did not disregard the traditional need for financial data, but they pointed out that the current emphasis on financials lead to an “unbalanced” situation with regard to other perspectives. Ultimately, the emphasis moved away from an effort to design a strategy to the execution and control of a strategy. As a BSC strategic planning tool user since 2001, I, like many others, found putting too much emphasis on balancing individual perspectives to be a distraction. As a result, I designed my own step-by-step process, focusing on the development of a tactical plan that could be measured and monitored. The objective was to develop a strategic plan, but more importantly, to operationalize it. I call the model the 12-Step Plan or The Plan. It can be used for business, organization, division or department strategizing. The graph on page 16 illustrates the steps to orient an organization toward a specific course or trajectory. Business planning requires a fair amount of information-gathering homework, such as customer/user surveys, market analyses and projections, competitive analyses, critical-incident results, etc. Scenario planning, developed by the RAND Corporation for military planning, is another excellent planning tool to examine various contexts. Traditionally, those in senior management looking to implement The Plan would do so during a two-and-a-half-day planning retreat. This retreat should be conducted off-site, where participants stop working on the present and work on the future by engaging in a focused environment, free of distractions. 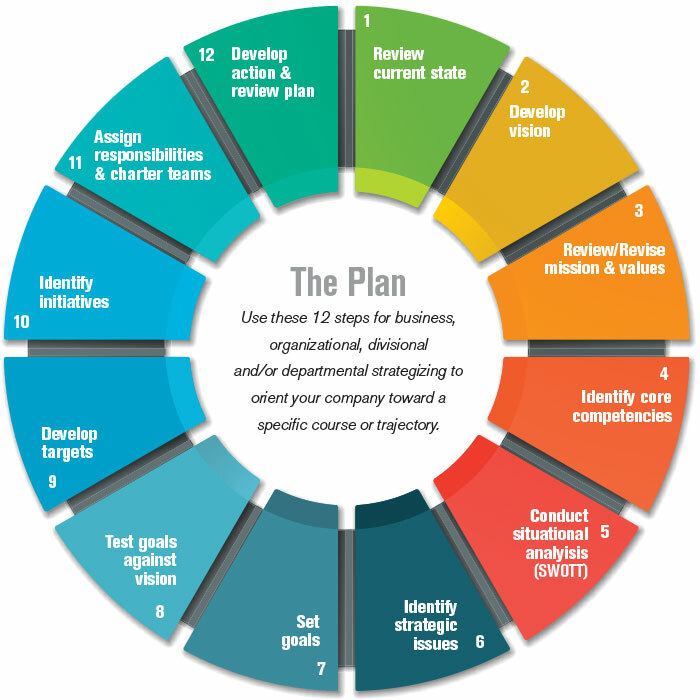 The following offers an introduction to the 12 steps of The Plan. Assess where you are currently. Brainstorming is an ideal method to engage the group and start the process. Create a vision of where you want to go. If you have already set a vision, reassess its value and purpose while paring it down to its essence for easy recall by participants. The group should describe the future state of your successful business, department or division. Conducting a visioning exercise like this—where an enviable organization with a successful journey and minimal turnover rate is described—helps plant the seed for an important launch. Then, determine what words best describe that state (in a future tense). Use examples to help give the participants possible ideas. This part of the process takes a few hours but gives a steering device that helps create the banner you wish to generate. Develop a mission statement, or purpose statement, for how you will make that vision happen. This is your collected purpose, or intent, summed up in a few words or sentences and is based on core values, principles and decision-making influences. Re-examine core competencies, determining unique strengths and capabilities you and your group possess that are critical to success and are difficult for other organizations to duplicate. This will be important to focus on when leveraging these strengths later. Conduct a SWOTT assessment (strengths, weaknesses, opportunities, threats and trends), which is a fairly lengthy process, involving reexamination of customer surveys, critical incidents, market analyses, financial projections, etc. Use equal amounts of facts/data and opinions/assumptions at this point. Strengths and weaknesses are internal, while opportunities and threats are external. Trends are what is currently common as far as technology, shifts in marketplace, growth, increase in energy costs, legislation, recruiting, etc. This part of the process, if done correctly, takes hours to do, but it serves as the basis of identifying gaps or potential deficiencies that need to be addressed, as well as strengths that should be leveraged. Mind mapping is a good visual tool to show relationships and connections. Identify the strategic issues that need to be addressed to move toward the vision by using the core competency input along with key SWOTT elements. Identifying capabilities will be a fundamental tool in the finished plan, so Porter’s Five Forces Model works well to examine competitive influences. Drawing from industrial organization economics to derive five forces that determine the competitive intensity and, therefore, the attractiveness level of an industry in terms of its profitability, the model is another tool for examining the strategic issues. It’s important not to rush this step, as this is where the strategy is formulated. Set goals that address the strategic issues identified in step six. This means taking each strategic issue and developing a goal to solve the issue and/or leveraging a strength or capitalizing on a trend to help set solid plan objectives. Will this goal allow us to meet the long-term needs of our vision? Could neglecting to strive for it slow our progress? Does this goal capitalize on our core competencies and abilities? Are we overlooking an additional objective that could help achieve our vision? This is a testing phase to ensure you’re choosing the right course of action through silent testing followed by group discussion centered on possible revisions and modifications. Identify key performance indicators for each of the goals so that individual targets and their due dates can be established. It is also critical to put metrics in place to measure this progress. Identify the actions or projects that will be undertaken to achieve the set goals, which can be individual initiatives, but will probably be team initiatives. Working in teams ensures more, higher-quality ideas and engagement, which leads to ownership of the end objectives. Decide which projects or processes you will refine or develop to address this goal. This is the tactical stage. Identify specific responsibilities to make the plan actionable and operational. Assign a senior leader to be a sponsor for each responsibility, ensuring ultimate completion and success. Make sure there are names, responsibilities, key performance indicators and targets for each goal. A dashboard can be set up to monitor and review progress. Periodic review meetings should be scheduled as standing (versus ad hoc or when convenient). Progress requires reviewing and addressing any slippages with sponsors and holding leaders accountable. Asking critical questions can keep the focus on delivering results. Preston Ingalls is the president and CEO of TBR Strategies. He holds two bachelor’s degrees in engineering and a master’s degree in organizational development. Visit tbr-strategies.com.